I am sure that many before me have been through this dilemma. I for one have been through it twice already. The first time, the mighty BMW GS was the winner but the second time I ended up getting a R1200GS Adventure Rallye, my current bike. Let me tell you why I chose it. I entered the big debate at the end of 2014, when I was looking for a new R1200GS LC. At that moment, I owned a BMW F800GT which I was really happy with, however, the GS was my dream bike. Touring 2 up around Europe, the additional luggage capacity, extra power and some of the nice rider aids that the GS offers, really tempted me. 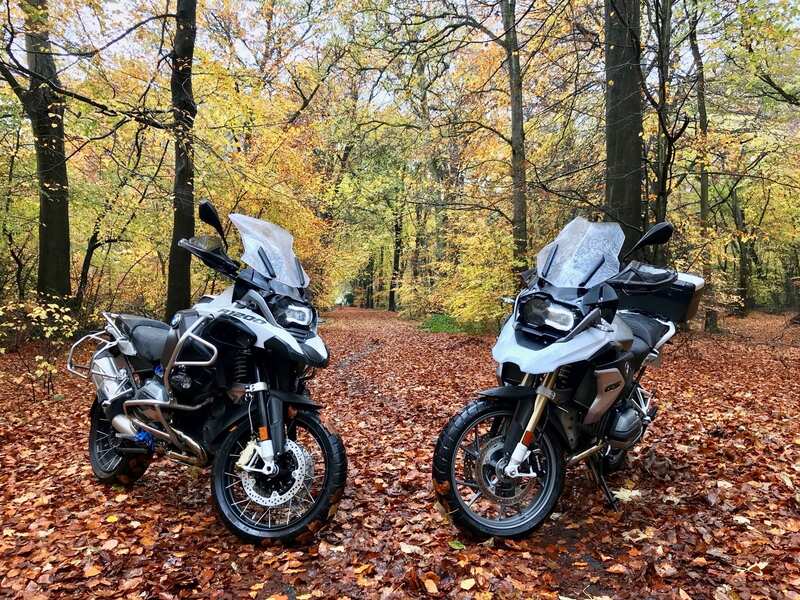 I started by test riding both models, but coming from an 800 tourer, I have to admit, I found the Adventure version huge! This is the main thing that put me off buying it the first time. Three years and 45,000 miles later, I decided I wanted to renew my bike so I started looking again. I went to my trusted dealership, BMW Bahnstormer Maidenhead, to test ride the new R1200GS Rallye. I was interested in the Rallye version because I really wanted the black engine and black spoke wheels- I had found the grey ones on my previous GS impossible to keep clean. I then tried the R1200GS Adventure Rallye. Having always liked the aluminium luggage, the new white and blue combination appealed to me more than the shiny blue and red of the standard GS Rallye. R1200GS – No surprises here, I just loved this bike! It was what I was used to but it felt more aggressive, maybe it was due to the looks. The new Electronic Suspension worked perfectly and the bike rode as smoothly or aggressively as I wanted. R1200GSA – The first task was to climb onto the bike, it wasn’t a big deal, but it definitely feels bigger and heavier when not moving. It must be noted that I am 5’11” (181cm) and test rode both bikes with the suspension in ‘auto mode’ and the seat in the high position. Once I started moving, the weight and the size difference disappeared. I could feel the bike being a bit lazier but not enough to be an issue. The better weather protection was noticeable but due to the size of the tank it felt a big strange to have my legs spread around it, this is something I quickly got used to it and the extra petrol will be handy at some point. Apart of the above there weren’t any notable differences. At the end of the day, both bikes can get the same accessories. However, it must be acknowledged that the Adventure comes with some of them as standard and this reflects on the price. I was greatly surprised when I realised the R1200GSA Rallye was cheaper than the standard GS when adding all the accessories to it! The main reason for this is the fact that the Adventure version comes with Sports Suspension (20mm higher and £300 to add on the standard GS), bigger windscreen (>£100), engine protection bars (>£200), LED auxiliary headlights (>£500) and aluminium luggage (>£1000 extra just for the rack to fit the luggage!). I could bore you with numbers, stats and endless data but all of this is on the BMW website and they are almost identical, apart from the suspension and the size of the deposit. This definitely didn’t influence me in my decision. Colour scheme: the standard Rallye was a bit too shiny for me, I like the white and light blue of the ADV. Metal luggage (price): with all the accessories I wanted fitted, the standard GS is more expensive than the GSA! And last but not least: it was a new toy for me! I had owned a standard GS for three years so why not try the GSA? I could always go back if I don’t like it, but at least I have tried it. Will I buy the ADV again? Well, I really don’t know. Let’s see how I get on touring with it around Europe this year! I’ve owned an R1200R and currently ride an RS. I have ridden a GS and have to admit that it has quite some appeal. Your blog has done nothing to abate my interest! Might have to save up some pennies. I had an R1200R as I loved it! It is a whole different bike though. I really enjoy the GS and it makes sense with the mileage we do and the luggage capacity for long trips. You have a nice blog by the way! I will spend some time later going through it! I had the same dilemma last year but went for the standard GS. I bought one of the last Triple Black models which also has the wire wheels & black engine. My choice was made after three test rides on each bike, I personally found the steering slower on the GSA which does have different geometry to the GS of which feels more ‘sporty’ to me. My partner rides pillion quite often & prefers the thicker plastic rack/grab handles of the GS & doesn’t like the feel of the aluminum ones so much so these would have had to be swapped out at great expense. These were my main reasons for choosing the GS but you can’t go wrong with any GS or GSA! I’ve ridden a few of these bikes including its more insane Austrian cousin the 1190R (my preference). And I have to admit that they are comfortable on the open highway and dirt roads. I just don’t like how tall they are especially when pillioning. For me I’ll be sticking with my sports tourer at this stage. Have fun on the new bike and I look forward to pictures of it around Europe. They are tall indeed, I guess I just got used to it. I really like the sport tourers but with the roads we have in England, I prefer a bit more travel in the suspension to keep the ride confortable. Awesome! If you post some photos tag @itisridingtime so we can see them!